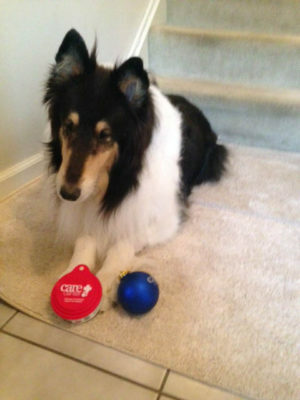 Liza, a sweet and playful 10-year-old Collie, lives in Pennsylvania with her family. Early in 2015, Liza began having health issues that prompted a trip to see the family veterinarian. Liza’s parents explained that she was coughing frequently and seemed to be trying to clear her throat. Her bark had also changed, becoming hoarse and dry. Over time, Liza’s breathing became strenuous and the family felt a lump on her neck. Liza was referred to veterinary specialist, Dr. Fiona Tam DVM, DACVIM. After a CT scan and further medical workup, Liza was diagnosed with a thyroid tumor. Due to the location of Liza’s tumor, surgery and traditional radiation therapy were not options. Thankfully Dr. Tam was familiar with a human cancer treatment that had recently become available for pets – stereotactic radiosurgery (SRS). Dr. Tam explained SRS to Liza’s parents and suggested they reach out to PetCure Oncology at Care Center in Cincinnati, Ohio. After learning more about SRS and talking with the staff at Care Center, Liza and her parents traveled to Cincinnati to get treatment. In Liza’s case, SRS offered a treatment with the intent to cure cancer – not just ease her symptoms. It was explained that SRS would deliver high doses of radiation with sub-millimeter precision, requiring fewer treatment sessions and minimizing side effects. In mid-December of 2015, Liza received SRS treatment for her thyroid tumor. She and her family were back home in time to celebrate Christmas. Her parents tell us she is doing great! Her breathing has improved, she is eating well and back to her playful self. Liza was treated at PetCure Oncology at Care Center in Cincinnati, Ohio.